bl.uk > Online Gallery Home	> Online exhibitions	> Asia, Pacific and Africa Collections	> Atharanala Bridge, Puri. 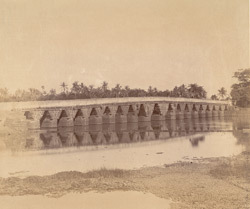 Photograph of Atharanala Bridge, Puri taken by William Henry Cornish in 1892. The location is given by Bloch as Bhubaneshwar, but is also described by M.M.H. Kuraishias as being, "...about two miles north-east of Puri on the Madhopur or Atharanala stream..." The bridge was built from a reddish rock in the early part of the fourteenth century. Rather than employing a true arch, the openings in the bridge bridge were constructed using successive tiers of stone, in some respects resembling a set of inverted stairs. The bridge has eighteen openings, each fourteen feet wide and eighteen feet tall. Its total length is 290 feet.